After using this box fan every single day, nearly round the clock in our bedroom, it was looking pretty scuzzy. 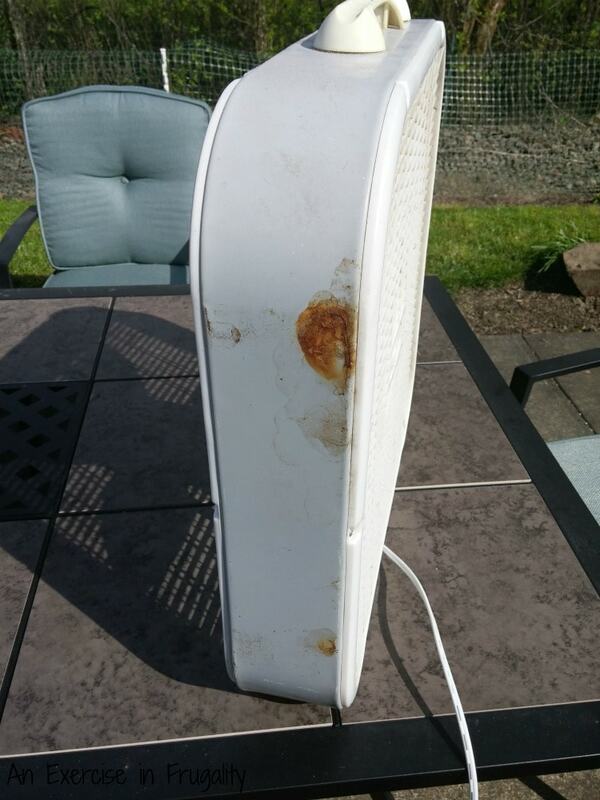 I wanted to take it apart to deep clean it, but I also knew that this thing was starting to become covered in rust from the moisture in the air. I COULD have just bought a new fan. They aren’t especially expensive, but why by new when DIY will do? 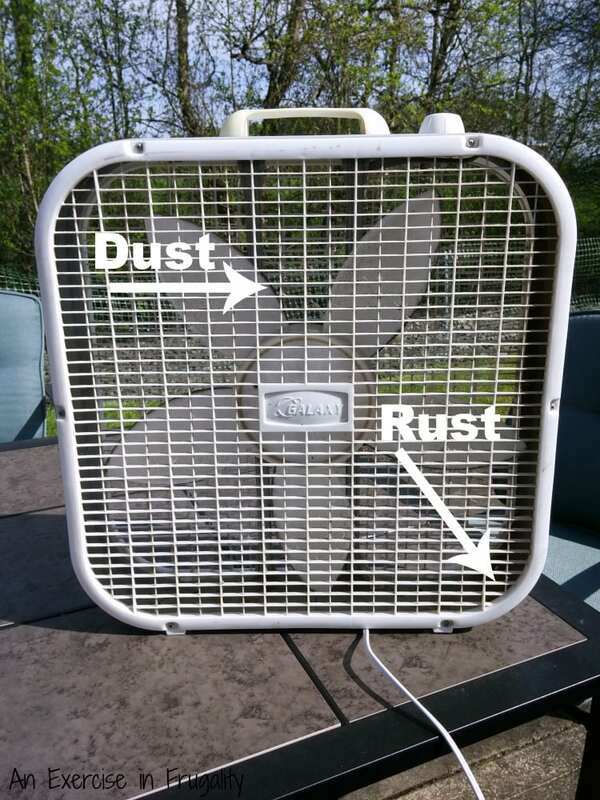 To take apart the fan, look for the screws holding the front, back and middle together. Take the screws apart, removing the exterior “grill” from both sides. 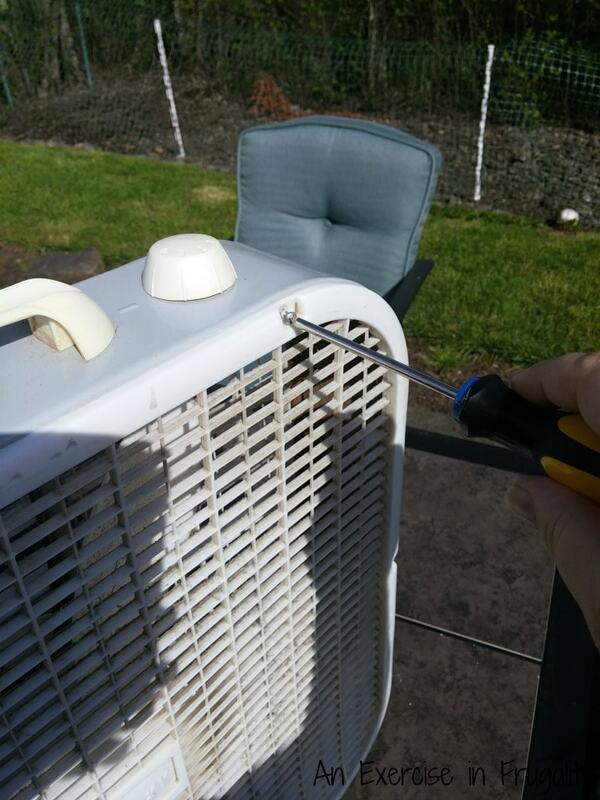 You can remove the fan blade on most fans by pulling (firmly) straight out on the fan blade. Once you have everything pulled apart, it’s time to start cleaning. I didn’t have to scrub, all I had to do to get all the dust off was drizzle a little dish soap on the grills, then I took the hose (yep, the garden hose!) and power washed the dust off. You could do this inside with your kitchen sink hose, however the spray might go all over, so I suggest doing this part outside. 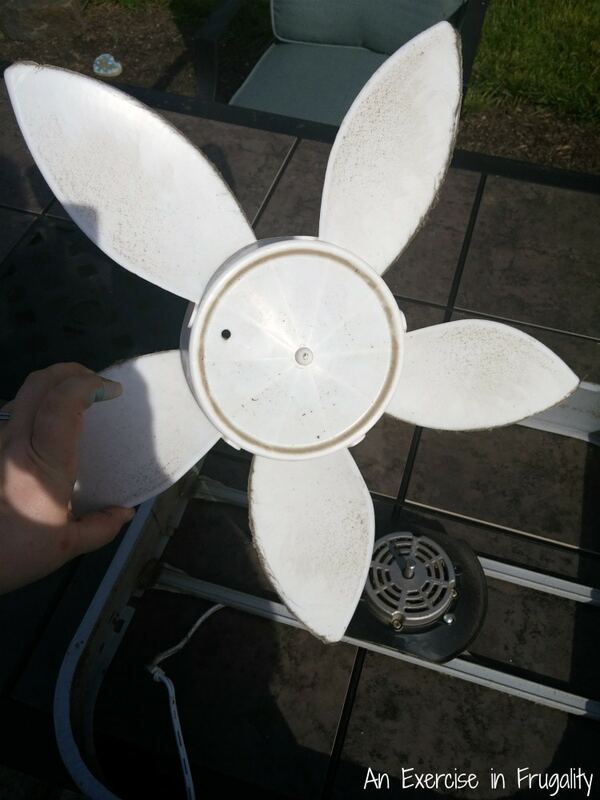 I left the pieces outside to dry completely in the sun, and took a can of compressed air and blew out the motor, removing all the dust and dirt stuck to the motor of the fan. All that’s left is to spray paint it. 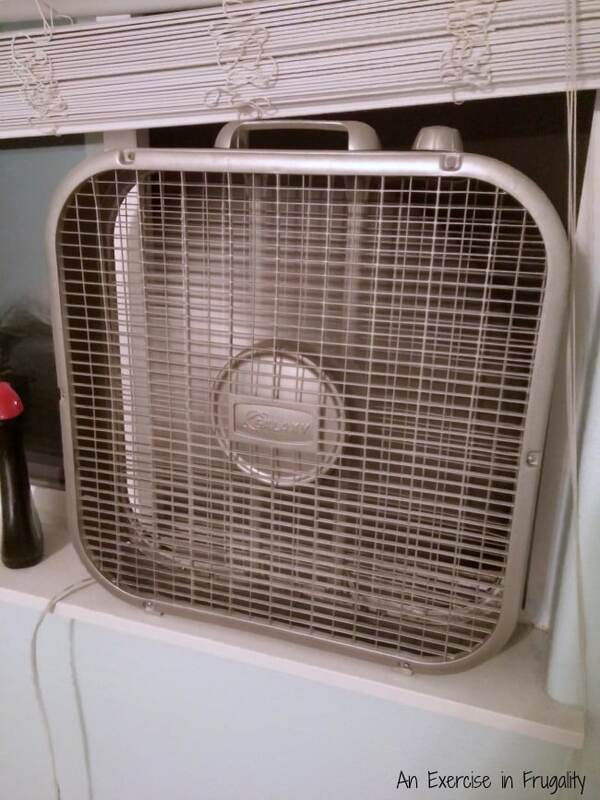 I decided to go this route because of how rusty my fan is, but also because I wanted this fan to look a little more high-end. I used a brushed nickel spray paint and did two coats over all the surfaces. You could do a bold, fun color or even make it look really chic by painting it gold! I am kind of in love with it. For a cheap box fan, it looks pretty good! You could paint yours with a pop of color, or use another metallic like gold or silver. For a kids room, you might consider painting the fan blades different colors too! The possibilities are really endless. No reason to have a cheap, boring fan! 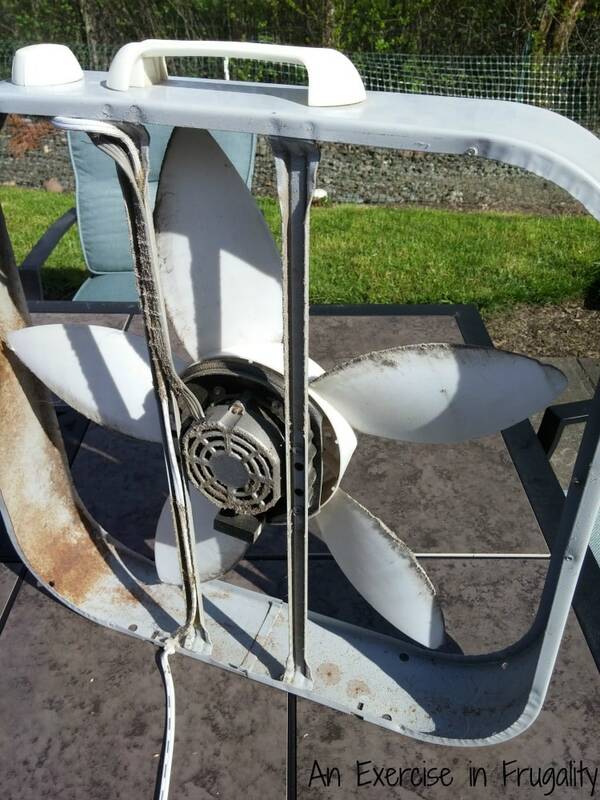 What do you think of this upcycled fan? Never would have thought of doing something like this. Love it and my husband is a lil obsessed with brushed nickel.